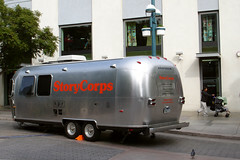 StoryCorps, a national nonprofit organization dedicated to recording, preserving, and sharing the stories of Americans from all backgrounds and beliefs, is en route to Phoenix, Ariz. to record 120 interviews with Valley residents from Jan. 6 – 29 as part of its cross-country MobileBooth tour. The StoryCorps team will collaborate with public radio station KJZZ 91.5 FM to record voices of the Valley. KJZZ will air selections of the local interviews recorded in the StoryCorps MobileBooth—an Airstream trailer outfitted with a recording studio—and create special programming related to the project. Segments of select interviews may also air nationally on NPR’s Morning Edition. Reservations will be available 10 a.m. on Thursday, Dec. 16 and can be made by calling StoryCorps’ 24-hour toll-free reservation line at 1-800-850-4406 or visiting storycorps.org. Additional appointments will be available on Jan. 7. Reservations are restricted to one per family. Participants can find more details on what to expect and how to prepare at storycorps.org. Open reservations for the public are likely to fill quickly. In addition to public interviews, StoryCorps will reserve interview appointments for people served by a diverse group of Valley community organizations. The MobileBooth will be parked at the Phoenix Public Library’s Burton Barr Central Library (1221 N. Central Ave.), which draws more than 2,000 daily visitors from a wide range of cultural, social, and economic backgrounds. KJZZ and the Phoenix Public Library will host a press conference and an opening ceremony in front of the Burton Barr Central Library on Jan. 6 at 11:30 a.m. to welcome the StoryCorps team and to celebrate the StoryCorps launch in Phoenix. StoryCorps’ MobileBooth interviews are conducted between two people who know and care about each other. A trained StoryCorps facilitator guides participants through the interview process. At the end of each 40-minute recording session, participants receive a complimentary CD copy of their interview. With participant permission, a second copy is archived at the American Folklife Center at the Library of Congress for future generations to hear. Founded in 2003 by award-winning documentary producer and MacArthur “Genius” Grant recipient Dave Isay, StoryCorps aims to create a growing portrait of who we are as Americans. By traveling to every corner of the country, StoryCorps currently has one of the largest collections of American voices ever gathered, with interviews collected from more than 60,000 Americans in all 50 states. In addition to two traveling MobileBooths, StoryCorps currently operates stationary recording booths at Foley Square in New York City, at Atlanta’s public radio station WABE-FM, and at the Contemporary Jewish Museum in San Francisco. To ensure a diversity of participants, StoryCorps sponsors four major initiatives: Historias collects the stories of Latinos throughout the United States and Puerto Rico; Griot preserves the voices and experiences of African Americans; the Memory Loss Initiative reaches out to people affected by various forms of memory loss; and the September 11 Initiative honors and remembers the stories of those most personally affected by the events of Sept. 11, 2001. To help offset its operating costs, StoryCorps requests a donation of at least $25 for each MobileBooth interview. If participants cannot afford the suggested donation, they may participate at no cost to ensure that StoryCorps remains a free public service. StoryCorps’ mission is to provide Americans of all backgrounds and beliefs with the opportunity to record, preserve, and share their stories. StoryCorps is currently one of the fastest-growing nonprofits in the country. Each week, millions of Americans listen to StoryCorps’ award-winning broadcasts on NPR’s Morning Edition. StoryCorps has published two books: Listening Is an Act of Love in 2007 and Mom: A Celebration of Mothers from StoryCorps in 2010—both of which are New York Times bestsellers. StoryCorps’ major funders include: The Corporation for Public Broadcasting (CPB), The Atlantic Philanthropies, The Ford Foundation, The Annenberg Foundation, The Kaplen Foundation, and Joe and Carol Reich. StoryCorps also relies on support from its participants and listeners. For more information, or to listen to stories online, visit storycorps.org. KJZZ is a listener-supported public broadcasting station licensed to the Maricopa Community College District. It is a community service of Rio Salado College’s Division of Public Service, which also includes KBAQ 89.5, Sun Sounds of Arizona and MCTV. KJZZ features a mix of local and NPR news, entertainment, jazz and blues—serving more than 240,000 weekly listeners. For more information, visit kjzz.org. This KJZZ and StoryCorps MobileBooth visit is made possible in part by the financial support of Simply Bread, a locally owned bakery serving Phoenix since 2006. Posted on December 14, 2010, in Downtown Vitality, Events and tagged Burton Barr Central Library, KJZZ, NPR, StoryCorps. Bookmark the permalink. Leave a comment.